The high school cafeteria at night is a lonely place. The tables are put away, and with them the scents and sounds of the day. There is almost no light illuminating the tile floor and low ceiling. Then, at this particular cafeteria at Waubonsie Valley High School in Aurora, on this particular Monday, a piano is rolled in. About 50 students drift in from the chorus room down the hall. Most of the boys are wearing bright green T-shirts, most of the girls purple. Somebody finds the lights. First, as the room is readied, they practice the dance steps alone, boys in one group, girls in the other. You hear the breathing and grunting that a full production normally masks, a reminder that, despite the smiling faces and fluid movements, this is hard work. Then choral director Mark Myers starts to play the piano and, suddenly, this drab, institutional space comes alive. Fifty voices join as one. Fifty dancers weave in and out of one another, turning a song — Michael Jackson's "Black or White" — into a show. This is Sound Check, the show choir at Waubonsie Valley and one of the best in the nation. Even in rehearsal, even as some of the dancing leads to involuntary bumps, the performance borders on stunning. What looks like an ordinary cross section of high school kids — pimples, pep and lots of bangs threatening the eyes — becomes something polished, almost professional. Close your eyes and you're listening to a recording. Open them, and you're wondering how an ordinary school district in an ordinary suburb develops the talent to do this, especially when, five years ago, Waubonsie Valley didn't even have a show choir. 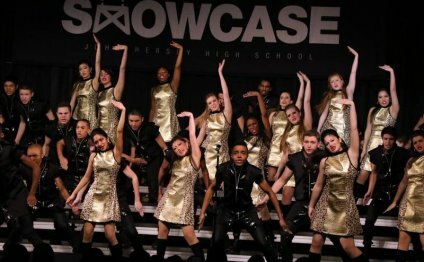 Thanks to television, people are paying attention to show choirs again after some in the music business thought the groups might be fading. "High School Musical" helped by highlighting singing and dancing in a high school setting. Even more on point, the Fox series "Glee" (Tuesdays, 8 p.m.) is specifically about a show choir, informed by co-creator Ian Brennan's experiences at Prospect High School in Mount Prospect. Waubonsie Valley 2010- "Showbiz Medley"